A new calendar year means a new funding year for the Universal Service Fund’s (USF) Rural Health Care (RHC) program! If you’re a rural healthcare provider looking for ways to save money on your telecommunications and connectivity services, this program may be able to help you. Many of our healthcare customers participate in this program every year, and we’ve seen firsthand how beneficial these funds can be for organizations looking to reach their IT, connectivity, and broadband goals. Whether you’re new to the program or a seasoned applicant, here’s some basic info you need to know about the RHC program as Funding Year 2019 (FY2019) rapidly approaches. In 2017, the total amount of authorized support distributed for the calendar year between all programs was approximately $8.84 billion. 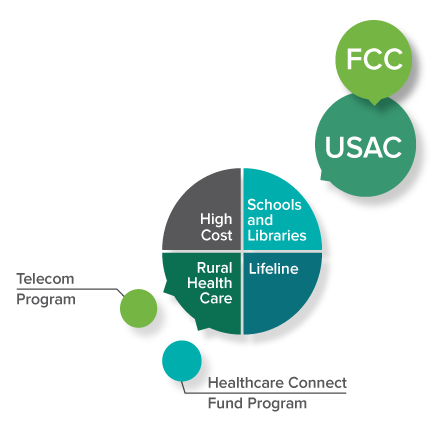 In order to finance the USF, the Federal Communications Commission (FCC) requires all telecommunications carriers including wireline and wireless companies, VoIP providers, and cable companies that provide voice to contribute a percentage of their revenues to the fund. Contributions change each quarter based on the fund’s demand and are often passed along to consumers via their phone bill. The fund is managed and distributed by The Universal Service Administrative Company (USAC)**, an independent, not-for-profit corporation designated by the FCC as the administrator of all four universal service support programs. How does the RHC Program work? ABC healthcare provider is located in a rural town and pays $1,000 per month for a T1 circuit. In a nearby city, that same T1 circuit costs only $100 per month for an urban healthcare provider. Under the HCF program, ABC healthcare provider, if eligible, would receive a flat 65% discount, calculating to $650 in funding every month for the funding year. Under the Telecom program, ABC healthcare provider, if eligible, would receive the difference between the monthly rural rate ($1,000) and the urban monthly rate ($100). In this example, it would receive $900 in funding each month for the funding year. Although ABC healthcare provider would receive more funding under the Telecom program in this particular example, that is not always the case for all networks. Expected funding amounts vary based on a multitude of factors, and it’s best to consult with USAC on which program may be best for your organization and network configuration. What services are eligible for funding? How much funding is available for FY2019? The FCC has not announced the funding cap for FY2019 yet, but the cap for FY2018 was $581.28 million. Each year the cap is raised to keep up with the pace of inflation and any unused funds from prior years are rolled over. The FCC has indicated they will announce the amount of any carryover funds available for the upcoming funding year during the second quarter of each calendar year. How can I find out if my organization is eligible? The healthcare provider must be a non-profit or public entity*. The healthcare provider must be located in a rural area as defined by the FCC. Visit USAC’s Eligible Rural Areas Search tool to verify that your location qualifies as a rural area. *Under the HCF program, some urban healthcare providers can file under a consortium. To learn more about consortia, visit USAC’s Consortia 101 resource page. When is the next funding year and filing window? The RHC program is broken up into funding years that run from July 1- June 30 every year. To receive funding, applicants file their forms during a designated filing window period which is a fixed period of time when all funding requests received are treated as though they were received at the same time. If funding remains after a filing window period, USAC may open another filing window period for that funding year. This means FY2019 will officially run from July 1, 2019 through June 30, 2020. USAC has also announced the 2019 filing window period will be February 1 – May 31, 2019. This means applicants will need to request funding during February 1 – May 31, 2019 for services running from July 1, 2019 through June 30, 2020. If you’re interested in contacting USAC, email them at RHC-assist@usac.org or call (800) 453-1546. Looking for a service provider with experience navigating federal funding programs? Since 1999, we’ve been helping healthcare providers achieve their network and technology goals while obtaining the maximum federal dollars. Let us put our 20 years of knowledge and experience to work for you. Email us at solutions@telequality.com, or call (210) 408-0388 to get started today! **TeleQuality is not affiliated with USAC which collects and distributes the USF. Additionally, we are not involved in any review or approval processes conducted by USAC, and not involved in the filing processes for individual healthcare providers.